I’m at the school twice a day, every day. My kids are at the Roden Childcare on the second floor. I come into the school by the Ashdale entrance and up the stairs. I pass the lost-and-found every day. 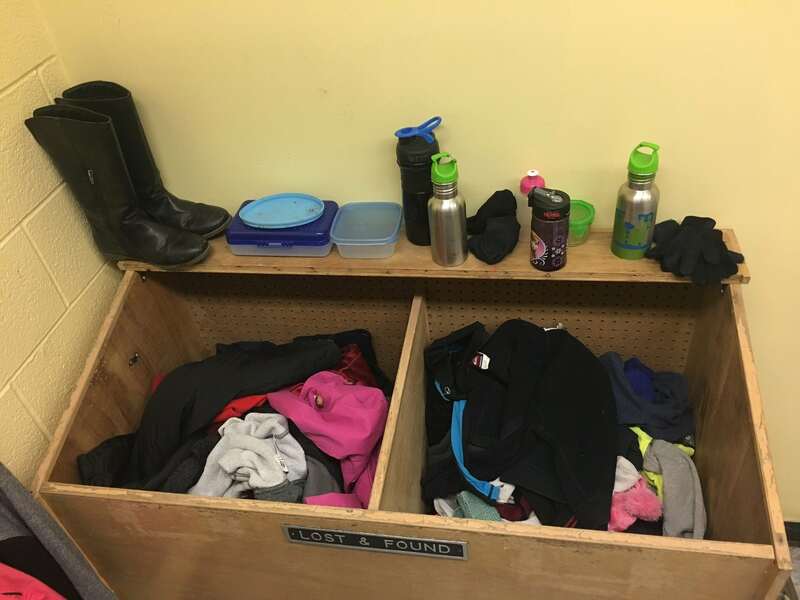 For several years now, I’ve watched the lost and found go from first-day-empty to out-of-control and overflowing. By December I’m always shocked that kids aren’t walking around in pyjamas and brown paper sacks based on the sheer quantity of clothing in the lost-and-found. I’ve never understood – it’s not just a sweater, a left hand mitten and some socks in the lost and found. Nope, no simple random library book or water bottle. The lost and found could be mistaken for a well-stocked sundries store. It contains winter jackets, snow pants, dresses, lunch boxes – ENTIRE BACKPACKS! I’ve never understood how a kid could misplace their winter boots and never come back to claim them. And this stuff isn’t cheap. MEC, Under Armour, Roots, Abercrombie, Lands End, Adidas, Nike, Bogs… Wools, leathers, denim, dryfit. There are the basics and then some pretty stylish extras! 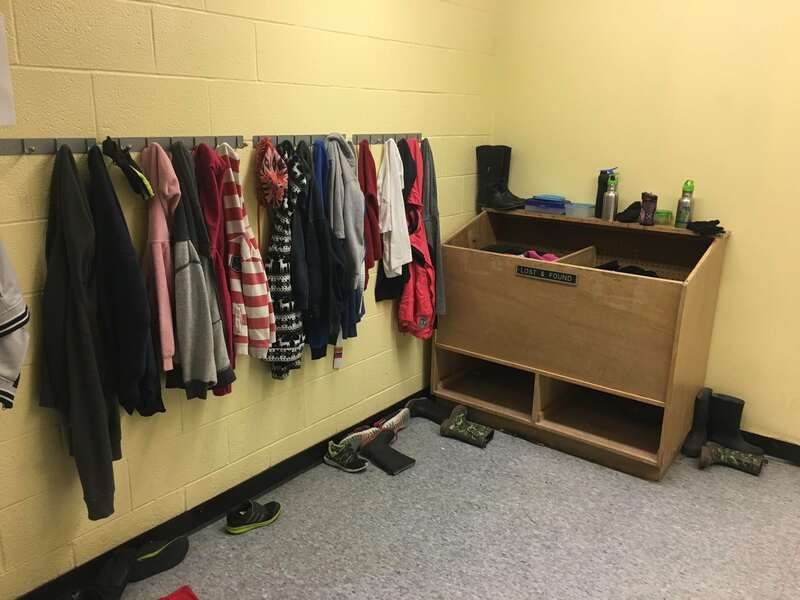 This year the school even installed a coat rack to hang jackets, sweaters and snow pants. This visual display should make it much easier to spot and identify pieces of clothing – and yet, they don’t get claimed. Day after day, week after week I pass the cornucopia of lost, found and unclaimed belongings and just watch it grow. The funny thing is, my boys lose stuff on the reg. One week it was indoor shoes, the next it was a dark blue backpack covered with kitties flying through space, another week was a neon orange winter jacket that had been misplaced. Never have I found any of these things in the lost-and-found. I had to search the school grounds, only to discover the jacket in the playground, the shoes in the wrong cubby and the backpack left behind in the office. I check the lost and found all the time. I rarely find more than a mitt. Finding a sweater is a vegas jackpot! The surprising thing is, I rarely find what I know has gone missing – I usually find something I wasn’t expecting to discover. those stray sweaters, mislaid mitts, cast-off coats and othermissing possessions. You’ll be surprised what you might find! A few times a year it gets bagged up and given away because the sheer quantity becomes overwhelming and too hard to house. There’s plenty in the lost-and-found already, and it’s only just half way through January, so take a peek if you haven’t been in lately, you may just be pleasantly surprised – or shocked, depending on what you find! I found last year’s mitts, and I call that a win!